This question has been preserved for historical reasons, but it is not considered on-topic, so don't use it as an excuse to post something similar. Quake (1,2 and 3) and DukeNukem 3D source code is available under the GPL. If part of the reason for open-source code is for code to be reused and recycled as it evolves, then I think influence and legacy would be two large factors in this decision. On this basis, I would probably vote Rogue / Hack / Nethack. It was one of the seminal influences behind the hack-and-slash dungeon-crawling genre, living on today in thriving communities that still play these old ASCII games, as well as having a significant influence on some of the most popular graphical games of all time, such as Diablo and Diablo 2. What about OpenTransportTycoon? :) Come one people - that's got to be the best! 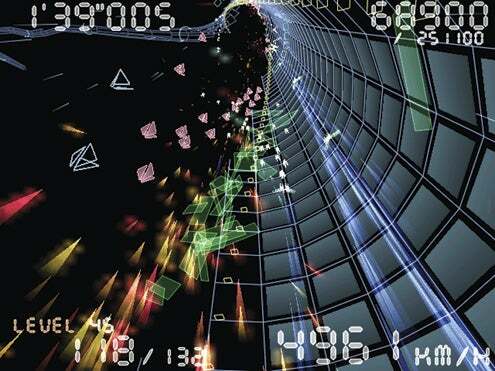 Check out Kenta Cho's games: http://www.asahi-net.or.jp/~cs8k-cyu/index_e.html. Most of them are written in D and use Simple DirectMedia Layer. They're a lot of fun and the source is extremely readable - a great showcase for the D language. There is a very good text based role playing game called 'make', you are on a quest to find hidden dependancies guarded by bearded sages and wrestle patches from them. Robocode is pretty awesome. See also its entry at Wikipedia. . . . . S . . . . .
. . * . . . . * . .
. * . . . * . . . .
. . . E . . . . . .
. . . . . * . 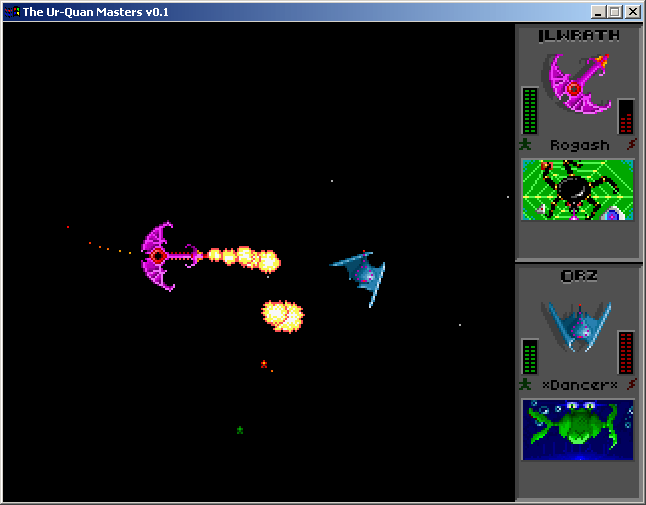 . . .
. . . * . . . . . .
Ur Quan Masters - Star Control 2 update. I'd have to go with GNU Chess. If you're really interested in looking at the code. From the wiki: "Version 5 was essentially a complete rewrite from scratch of GNU Chess to eliminate spaghetti code and replace antiquated data structures with more advanced computer chess implementation techniques." I can't believe Hunt the Wumpus hasn't been mentioned. My personal favorite is UFO Alien Invasion. I loved the original UFO and this is a really good clone. What? No one here likes Tux Racer? No question in my mind, GL Tron. How can you not love it? Its source code was released in 2004 (I think) and since then it has been improved very much by the mod community. The mod goes under the name JA2 v1.13 and the community resides at Bear's Pit. If your intent is to see how a game works and are willing to spend a small amount of money to see it, I highly recommend the Torque Gaming Engine from GarageGames. For $150 you get the entire engine source code of a AAA game title (Tribes 2). The content was ripped so you aren't buying Tribes 2, but content is easy to replace. Compared to the cost of other comparable engines, Torque is an amazing bargain. And if you ever decide to produce a game, you can do so without overbearing licensing restrictions. EDIT: I know its not Open Source, but for your purpose of learning code it should qualify. The engine is coded in C++ and there is a script layer that is similar in syntax to C#/Java. Empire, the Wargame of the Century, naturally. You can download it from classicempire.com. Empire has been flunking out students and wrecking marriages since the 1970's. Wormux really has a fantastic architechture. i'm a professional game developer and i think that these guys really might be too. the quality of the work smells of years of game dev experience. I've spent many hours playing FreeCol (a clone of Sid Meier's Colonization). I mean "studying the source code of FreeCol". Quite recently a few of the games from the Humble Indie Bundle went open source and are probably pretty interesting for people to look into. Gish, Lugaru, and Penumbra were all opened. or Empire I've invested (lost) so much time in both of those. Dopewars is fun to play on the internet or on a LAN with friends. And it runs on Windows, OSX, Linux, iPhone and there is an adaptation on Facebook. It's a FPS, technically advanced as Quake 3, open source, with nicely documented code and a great community. I can't believe, nobody mentioned Armagetron Advanced yet! For fans of the movie Tron, this is a nice way to waste some time online with other players worldwide. What's the best open source wiki platform? Have any classic NES games been open-sourced?